Astrobiology is an emerging field, and as such it has for a long time lacked an authoritative textbook – one that assembles the various lines of research into a cohesive story, highlights where the field has been, and charts its future path. Planets and Life is among the first contenders for this throne. Astrobiology is a fiercely interdisciplinary field and so this type of rigorous academic synthesis is both more difficult and more important than usual. Editors Woodruff Sullivan and John Baross have assembled an impressive team of experts, making full use of their University of Washington astrobiology colleagues. 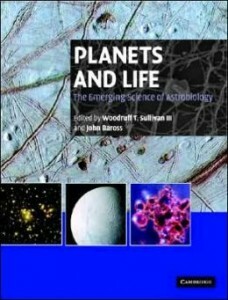 The book breaks down into seven sections in accordance with the multifaceted nature of the subject: history, the origin of Earth-like planets and atmospheres, the origin of life on Earth, life on Earth, potentially habitable worlds, searching for extraterrestrial life, and the future of astrobiology. Perhaps the book’s most impressive achievement is its ability to discuss high-level material over a wide range of disciplines. Drawing on advanced concepts in biology, chemistry, astronomy and even philosophy, Planets and Life effectively provides background for readers whose expertise may lie in a different field. Before delving into curved arrow diagrams (graphic representations of how electrons move in chemical reactions), Alonso Ricardo and Steven Benner bring readers up to speed on Lewis structures and bonding energies in their chapter on “The origin of proteins and nucleic acids.” To prepare the reader for the subsequent discussion on theoretical identity statements (a way of explaining life as more than just a description of its traits), Carol Cleland and Christopher Chyba run through various definitions of the term “definition.” It is unusual to encounter serious discussion of the “soft” sciences (such as the ethical concerns of the search for life) alongside rigorous treatment of “hard” science topics; Sullivan and Baross have compiled a book that does just that. Planets and Life does show growing pains, however. Because the book draws on expertise from a number of contributors, the finished product appears piecemeal at times. For example, the initial mention of isotopes leaves it to a paltry footnote to describe the notation and fails to adequately discuss the basics. A much more comprehensive introduction to isotopic concepts occurs more than a hundred pages later. Likewise, after a lengthy mention in the “History of Astrobiology” section, Percival Lowell receives superfluous coverage in the “Mars” chapter. In some cases, the book prioritizes full engagement of the University of Washington faculty over logical organization of the material. Chapter 14 discusses the limits of “Earth-life” in terms of the extremes of temperature, salinity, radiation, and so on. Chapter 15, co-authored by faculty member and psychrophile expert Jody Deming, expounds on life in ice: a subset of material from the previous chapter. But extreme conditions of salinity, high temperature, acidity and radiation didn’t seem to merit their own chapters. Planets and Life also contains a noticeable and slightly unusual element of recruitment. The prologue cheerily labels astrobiology “a science of optimism,” and the concluding chapter has a full three pages on the University of Washington astrobiology graduate program. It is unclear if Planets and Life will stand the test of time, a difficult task given the rapidly moving nature of a nascent field. But the signs are already there – in the “potentially habitable worlds” section, Enceladus is noticeably absent, and significant advances in the field of extrasolar planets have been made since publication. And with active missions on and around Mars and Titan, certain sections were doomed to be out of date even before the book hit the shelves. Nonetheless, Sullivan and Baross do an impressive job of engaging the issues of astrobiology at a high level while keeping the field’s guiding questions in full view. Planets and Life is an effective text book that deals nicely with the interdisciplinary nature of the field, moving fluently from philosophy to ethics to biochemistry. Despite some bumps along the way, this book has successfully blazed a trail for the study of astrobiology in university classrooms.